Only the most severe hemorrhages on the arms and legs require a tourniquet. Apply it as soon as possible to stop unnecessary blood loss. When a major artery is severed, the patient can bleed to death in less than a minute, so speed is everything. Proper training has the greatest influence on tourniquet effectiveness; if you have one make sure you know how to use it. To bump up the difficulty put the “injured” hand on the wall to simulate a trapped limb while you apply the tourniquet. There are 2 main types on the market, the CAT and the SOFT T - wide. Adjusting strap uses velcro to secure it and stop it from loosening. Uses a smooth plastic windlass to tighten down the tourniquet. Has a red tabbed adjusting strap to make finding the end easier. Has a place to write the time of application. Has two hooks that the windlass can lock into with a velcro cover to stop it from slipping out. Adjusting strap uses friction buckle system to secure it and stop it from loosening. Uses a gripped metal windlass to tighten down the tourniquet. Has a metal latch on the adjusting strap to make looping it around a trapped limb easier. Has a triangular latch that locks onto a groove in either end of the windlass. 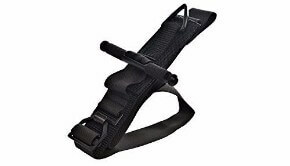 The SOFT T - wide tourniquet has become a standard item for law enforcement in New York State because it has a sturdier design and an easy to use buckle clasp system for looping the strap around a trapped limb. Note: The SOFT T - Wide is not the same as the SOFT T. The Wide’s design is more comfortable, intuitive, compact, and streamlined than the regular SOFT T.
It has been shown that tourniquets save lives in the military and law enforcement, but one of the largest problems in adapting tourniquets to civilian use is complacency. In average civilian life, you will not need a tourniquet often. In fact, most of us will go our entire lives without needing one. If you do need a tourniquet, however, you need it fast. In a first aid kit, a tourniquet tends to start out on top and gradually work its way down towards the bottom of the pack as other items get used and placed back on top of it. Soldiers and police officers carry tourniquets on their person when in active duty for quick and easy access. If the tourniquet is at the bottom of your pack, it won't do you much good in a real emergency. A dangerous job is a good reason to carry a tourniquet in civilian life. When working around heavy machinery crushing injuries are a distinct possibility. In this case, it will provide a quick fix to a potentially deadly problem. There’s no need to have it on you 100% of the time if you’re only around heavy equipment during certain times of the day. Even though tourniquets are underused in civilian life, there is evidence supporting their efficacy. A 2017 study looking at civilians admitted to the emergency room with limb injuries found that the survival rate was significantly higher when a tourniquet was applied. If possible put pressure on or proximal to the wound in order to slow the bleeding. Unhook the clasp and thread it around the injured arm or leg making sure the strap isn’t twisted. It should be placed high and tight regardless of where the injury is. This means put it on the arm close to the shoulder and on the leg close to the hip as tight as you can wind it. This is because internal injury may extend farther up the limb than is visible from the outside. Hook the metal latch together and pull out the slack in the line, so that the tourniquet fits snugly on the limb. You can use your chin to help hold it in place. Turn the windlass until the bleeding has stopped, and hook either end of the windlass into the triangular latch to secure it. Write down the time of application. A tourniquet should not be left on for more than 2 hours to prevent permanent nerve damage. The company RevMEDX has recently come out with several interesting new products that challenge the way we treat life-threatening traumatic injuries. One of the greatest problems with tourniquets is applying them quickly enough. Usually it's a pain to keep a tourniquet on your person in the unlikely event that your arm gets cut off, unless you're military or police. To address this problem RevMEDX has come out with a belt that doubles as a tourniquet with a ratcheting mechanism for tightening. It may not be the most fashionable apparel, but it will hold your pants up and could save your life. The Tactical Mechanical Tourniquet (TMT) was developed to improve upon some of the CAT tourniquet's shortcomings, namely the CAT's difficulty in completely stopping lower limb bleeding. Find out more about the TMT at Combat Medial Systems. Historically, most, if not all, tourniquets used in the field use a windlass mechanism, where a bar is twisted until the tourniquet is tight. Elastic models, like the RATS tourniquet, have been gaining popularity as a cheap and effective alternative to windlass models like the SOFT T and CAT tourniquets. There are a lot of reasons to recommend the RATS; it's cheap, it stops bleeding wonderfully, it doesn't loosen after it has been applied, and applying it is faster than windlass tourniquets. This isn't new technology though; surgeons have been using elastic tourniquets for years. The problem is that elastic tourniquets can create too much pressure, causing painful and permanent neurovascular damage. Pressure created by elastic tourniquets increases by a multiple of the length stretched during each wrap of the elastic, so depending on how far the elastic is stretched, the pressure can vary substantially. This makes it tricky for the user to apply enough pressure to stop the bleeding but not enough to cause damage. It should be the first thing you see when you open your first aid kit. If your first aid kit has pockets on the outside, you may even want to put it there instead. The idea is that you want to be able to grab it as fast and as easily as possible. When you pack it, you should also preset the adjusting strap so that the loop is long enough to go around your thigh. When in doubt, APPLY IT. You can take it off any time within the next 2 hours without damaging your patient. If your tourniquet doesn’t have a place to write the time of application, take some masking tape and wrap it around the end of the adjustment strap. It’s fine to use 2 if 1 doesn't stop the bleeding. This can be used in conjunction with quick clotting bandages, israeli bandages, or other hemostatic agents. This won’t feel comfortable. On an uninjured arm proper application will cause some bruising. Try to remove heavy coats or pants. It can be applied over clothing, but bunched or folded cloth makes it more difficult to stop blood flow. For a fast deployment, you can carry your tourniquet using a tourniquet holder. Make sure it’s easily accessible. If you buy it, practice applying in <30 seconds. SOFT T Wide Tourniquets are the best (not SOFT T or CAT). Should be placed high and tight, close to the body. Don’t leave a tourniquet on for more than 2 hours. Tactical Combat Casualty Care Guidelines 2 June 2014. https://www.itstactical.com/wp-content/uploads/2014/07/TCCC-Guidelines-update-june-2-2014.pdf. Accessed March 25, 2015. "Hypovolemic Shock and Tourniquets". Healthtraining.inhs.org. N. p., 2017. Web. 29 Jan. 2017. Beaven A, Briard R, Ballard M, Parker P. "Two New Effective Tourniquets for Potential Use in the Military Environment: A Serving Soldier Study". Military Medicine [serial online]. July 2017;182(7):e1929-e1932. Available from: Military & Government Collection, Ipswich, MA. Accessed August 8, 2017. Teixeira, Pedro GR, et al. "Civilian Prehospital Tourniquet Use Is Associated with Improved Survival in Patients with Peripheral Vascular Injury." Journal of the American College of Surgeons (2018).